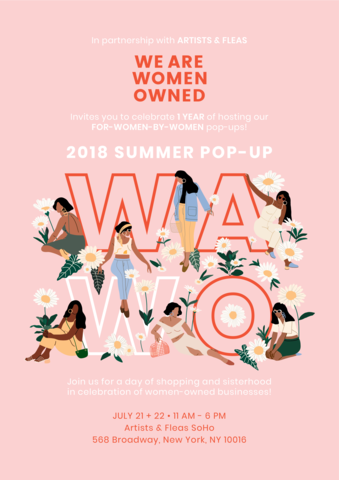 Join the Rosebud CBD team this weekend, July 21st and 22nd, for We Are Women Owned – a female-powered shopping experience at Soho’s Artists & Fleas. Rosebud CBD will be showcased beside 12 other local, female-owned businesses on both days from 11 am-6 pm, including Unyé, Indigo Pony Designs, Rawly Bold, Lumiére by. Lisa, styleNmotion, Etymology, Loulette, Metrix Jewelry, The Style Theory, (Em)power Laces, RoseSuds, Little Words Project and Social Sunday. Rosebud CBD founder, Alexis Rosenbaum, will be offering samplings of her 350, 700, and 1000 mg organic, Oregon-grown CBD, and will be providing educational resources for those unfamiliar with the non-psychoactive superfood. Participants can take advantage of $5 off all in-person purchases, and can enter our daily raffle of a bottle of Rosebud CBD — winner’s choice!